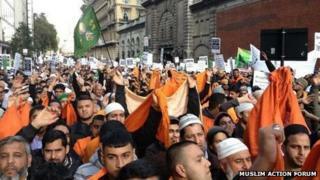 Up to 3,500 people have protested outside the headquarters of Google in central London over an anti-Islam film. Buckingham Palace Road in Victoria was closed for three hours by the demonstration. The protesters called for the trailer for the US-made film, Innocence of Muslims, to be removed from YouTube, which is owned by Google. Google has said the video is "clearly within our guidelines and so will stay on YouTube". The trailer for the film has provoked anger for its portrayal of the Prophet Muhammad. YouTube has blocked access to the video in some countries such as Libya, Egypt, Saudi Arabia, Indonesia and India. Khalid Mahmood, of campaign group Voyce, said it was the first demonstration against Google in the UK and other action would follow. He said: "This is a demonstration against hate speech on the internet and YouTube in particular." A YouTube spokesman said: "We work hard to create a community everyone can enjoy and which also enables people to express different opinions. "This can be a challenge because what's OK in one country can be offensive elsewhere."